Japan had exported a fair number of two-door hardtops in the seventies and early eighties, but the pillarless four-door variety had always been reserved for domestic consumption. Semantics aside, the pillared four-door hardtop was functionally a sedan, and that, combined with the popularity of pricier Japanese cars in North America, created new opportunities for export. As a result, some of these cars were sold outside Japan, although they were seldom identified as hardtops in other markets. 1990–1993 Acura Integra sedan: Based on the Honda DA Integra hardtop, but with 1.8-liter (113 cu. in.) engines rather than the 1.6-liter (97 cu. in.) fours offered in Japan. 1990–1991 Lexus ES250: Essentially a VZV20 Camry Prominent V-6 hardtop with minor cosmetic changes, trading the JDM car’s 1,992 cc (122 cu. in.) 1VZ-FE for the bigger 2,508 cc (153 cu. in.) 2VZ-FE engine from the U.S. Camry V-6. 1991–1994 Acura Vigor: The wide-bodied, 2.5-liter (150 cu. in.) 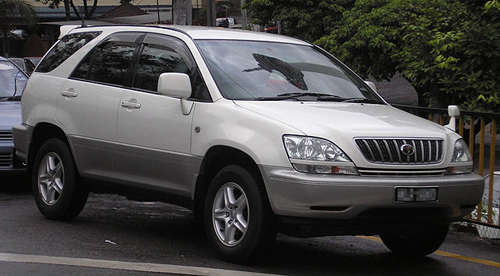 CC Vigor was actually introduced first as an Acura and subsequently replaced the smaller 5-number CB Vigor in the Japanese market in early 1992. 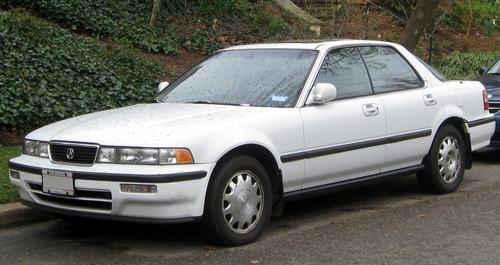 1992–1995 Lexus ES300: A pillared hardtop version of the wide-body, U.S.-market (VCV10) Camry (known in Japan as Toyota Scepter to distinguish it from the JDM Camry). The ES300 was actually designed in the U.S. as a Lexus, but a RHD version was sold in Japan as the Toyota Windom. 1992–1995 Mazda 929: A federalized Mazda HD Sentia. 1993–2000 Subaru Impreza sedan: The four-door GC Impreza was advertised as a hardtop sedan in Japan. 1994–2000 Acura Integra sedan: A federalized Honda DB Integra hardtop. 1995–1998 Acura TL: A federalized Honda UA Saber (successor to the Vigor). 1996–2001 Lexus ES300: Although it no longer exactly qualified as a pillared hardtop (the Japanese press release called it a sedan), the second-generation (MCV20) ES300 was again sold in Japan as the Toyota Windom. Amusingly, Toyota’s home-market advertising and publicity materials made much of the fact that the Windom was the JDM version of a model sold elsewhere as a Lexus! The four-door hardtop, pillared or otherwise, slowly faded out in the nineties. Some of the offerings hadn’t done well: the Mazda Persona/Eunos 300 was a commercial failure, as was the Mitsubishi Emeraude. The Corolla Ceres and Sprinter Marino, which would seem to have had great potential, apparently didn’t meet sales expectations, although both models lingered for three years after the rest of the E100 Corolla/Sprinter line had been replaced. 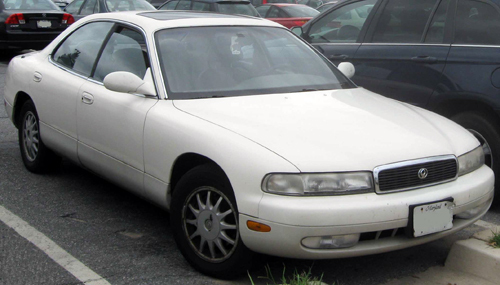 By 2001, most Japanese four-door hardtops would be gone or replaced by conventional four-door sedans. There were several reasons for the decline. One was a shift in tastes from sedans and coupes to SUVs. Another was the growing popularity in Japan of European luxury cars and the emergence of Japanese-made cars made to compete with the Europeans, most of which were conventional four-door sedans. 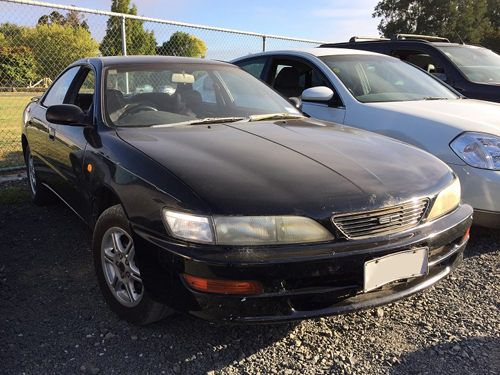 (It’s noteworthy that high-end JDM cars of this period, like the Toyota Mark II and Nissan Laurel, were usually hardtops while export-oriented models like the Toyota Celsior/Lexus LS400 and Infiniti Q45 were not.) Beyond that, the four-door hardtop style may also have become a little old hat. The idiom was more than 20 years old, after all, and the demise of the pillarless models — combined with the growing ubiquity of the pillared style — made it less special than it once was. It probably wouldn’t be impossible to create new pillarless four-door hardtops, as evidenced by the continued existence of compact MPVs with sliding doors on each side (e.g., the Ford B-Max). However, achieving that style while complying with current roof crush and side impact standards would no doubt be expensive, so any future pillarless four-doors are likely to be high-end luxury cars rather than mid-price models like the original Toyota Carina ED. There’s no particular reason the pillared four-door hardtop couldn’t make a comeback either, but barring a major turnaround in the Japanese economy, it’s unlikely to happen in Japan any time soon. The Japanese industry is currently struggling to stay competitive in the face of limited development funds, unfavorable exchange rates, and a shaky domestic market that seems primarily interested in the tax savings offered by hybrids and kei cars. Since the pillared hardtop body style didn’t make much impression on the U.S. market (most of the four-door hardtops marketed in North America weren’t even identified as such), there’s little incentive for a revival in the near future. For the time being, Japan’s four-door hardtops remain something of a curiosity. Four-doors of any stripe seldom seem to attract the same kind of fan loyalty two-doors do, and the limited exports mean that many of these cars are quite obscure. Nonetheless, they are intriguing — particularly the pillarless models — as unusual variations on otherwise familiar themes. The author would like to extend special thanks to Don Andreina and Scott McPherson for their assistance with this article (and the use of Scott’s photos) and Igor Smagin for the use of his photos of the Carina ED. If you’re viewing this article page by page, see the next page for the (lengthy) bibliography.